A screenshot of a reservation made on Airbnb of a deed-restricted unit in Aspen's affordable housing program. A local woman has been kicked out of her taxpayer-subsidized affordable housing after it was discovered she was renting her apartment on Airbnb. Katherine Peach’s lease for her one-bedroom unit at Truscott was terminated last month and she moved out. The Aspen-Pitkin County Housing Authority, which is the landlord at Truscott, learned she was violating the terms of her lease in February. They discovered the infraction when three people came into the Truscott office Feb. 2 asking where Airbnb #72 was, according to a letter to Peach from property manager Janine Guerrero. Guerrero’s Feb. 6 letter only demanded that she come into compliance and remove the listing from the Airbnb website within three days, essentially giving her a chance to make it right. Twenty days later, the listing remained on Airbnb, causing Guerrero to write a letter March 29 informing Peach that her lease was being terminated. The next day, Peach pleaded with Guerrero to let her stay in the unit. Guerrero also noted that she had called Airbnb and a company representative told her the listing would come down right away if it was deleted. Peach didn’t answer phone calls, an email or text message from The Aspen Times seeking comment. It appears that the apartment, described as a “spacious, one-bed, full kitchen, low-key vibe” in a “locals’ community,” had been listed on Airbnb since at least April 2017. APCHA officials realized it had been going on in the past because the guests from Feb. 2 told housing officials the unit’s “guest book” said they could get a three-day parking pass. Julie Kieffer, APCHA’s qualifications specialist, said three or four compliance cases regarding online rentals come through the APCHA office a year. 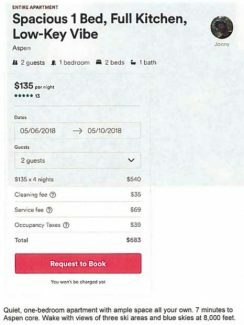 The city of Aspen is in the process of hiring an outside firm to identify how many people are using online rental platforms, and not paying sales and lodging taxes. Deed-restricted units will be part of the probe. APCHA has created a senior compliance officer position, which will be advertised as soon as the end of this week. That person will be investigating these types of violations, along with the many others that happen within APCHA. Kieffer said she occasionally trolls websites such as Airbnb and VRBO. “If I get a tip, I’ll start searching because it triggers my curiosity,” she said.